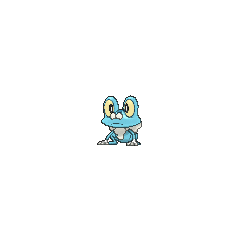 Froakie in game: 14,027 Who? Important notice! Pokemon Froakie is a fictional character of humans. Froakie (Japanese: ???? Keromatsu) is a Water-type Pokémon introduced in Generation VI. 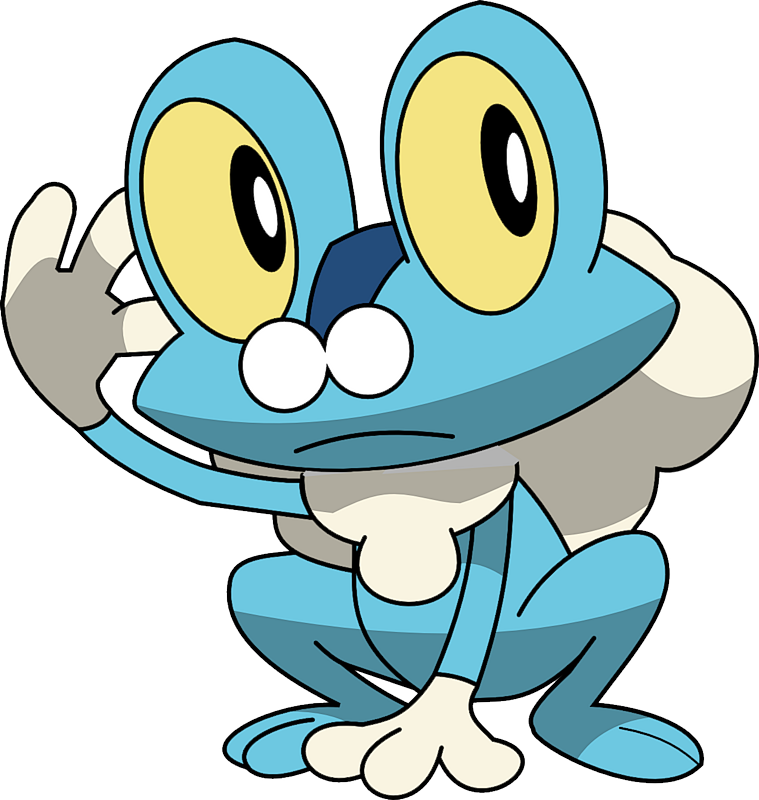 Froakie is a quadruped, frog-like Pokémon. It has light blue skin, white hands, and a dark blue stripe from the center of its oval head to its nose. Its eyes, which have yellow sclera, black irises, and white pupils, protrude vertically from its head due to their size. Froakie produces a large mane of bubbles from its chest and back and has two small bubbles on its nose. The delicate yet flexible bubbles, called Frubbles (Japanese: ???—? Keromousse), reduce the damage Froakie takes from attacks. It has three fingers and two toes on its hands and feet. Despite its carefree attitude, it is vigilant of its surroundings. Froakie is both light and strong, making it capable of jumping incredibly high. Froakie made its debut appearance in Kalos, Where Dreams and Adventures Begin!. It appeared again in Lumiose City Pursuit! where it helped Ash calm down a Garchomp. It then decided to follow Ash, allowing him to catch it and become Ash's first capture in Kalos. Ash's Froakie evolved into Frogadier in A Stealthy Challenge! during a battle alongside Pikachu and Sanpei's Greninja against Saizo's Barbaracle. Multiple Froakie appeared in a flashback in Cloudy Fate, Bright Future!. 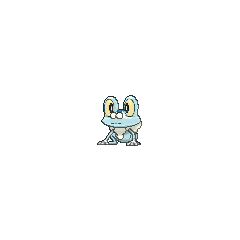 Another Froakie appeared in A Battle of Aerial Mobility!. A Froakie appeared as a plush toy in A Jolting Switcheroo!. A Mirror World Froakie appeared in a flashback in The Cave of Mirrors!, under the ownership of Mirror Ash. Two Froakie appeared in Till We Compete Again!, where one was a Starter Pokémon that was offered as a choice for a Youngster to choose from and one was on a video screen in the Lumiose City airport. Froakie is tied with Rowlet as the smallest unevolved starter Pokémon. Froakie has the highest base Speed stat of all unevolved starter Pokémon. Froakie is based on a frog. Its bubbling white foam is a reference to frog foam nests, created by some species such as the Tungara frog and grey foam-nest tree frog to protect eggs. 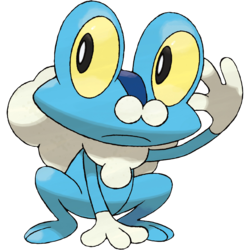 Froakie's foam resembles a "backpack" of sorts, and has also been used in the anime as a makeshift hood, which is more than likely a reference to dorobo (burglars or thieves). In Japanese folklore and culture, dorobo use furoshiki cloth bags to hold stolen goods and mask their identity, referenced in Froakie's usage of its foam. In the older games, the Burglar Trainer class took on the appearance of dorobo. 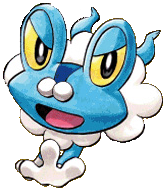 Considering its evolutions, its characteristics, as well as its association with thievery, Froakie may also be based on a ninja. Keromatsu is a combination ???? kerokero (onomatopoeia for a frog's croaking) and ? matsu (bubble or foam) or ?? himatsu (spray or splash).